H/T to Julie D, the Happy Catholic for the link to an article posted by Of a New Springtime regarding the late Warren Zevon's biography. Even though the only song I am familiar with and actually love is Werewolves of London, I have been fascinated with this artist for a long time. I hope you find the blog entry as interesting as I did. Okay, the last one worries me a tad. I hope you three were kidding. Please vote in our new survey/poll regarding house blessings. 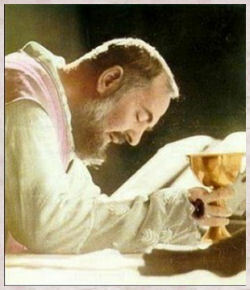 O Jesus, my love, truly present in the Holy Eucharist, I adore you. Dear and gentle Jesus, I love You and I thank You for the gift of Your self in this Sacrament of Love; The Holy Eucharist. I offer to You my heart and the love which it contains, little as it is, to make up for the ingratitude of so many. 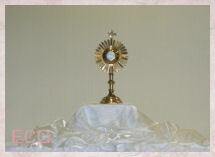 For centuries You have remained in the Blessed Sacrament for love of us. May all hearts burn with love for You. 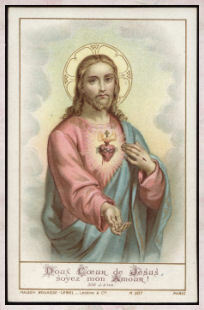 Merciful Heart of Jesus, hear the prayers we humbly bring before You (here mention your petitions). From this Holy Sacrament may Your light and Your peace shine forth into the darkness of all sin. Jesus, You are my love and my all. Have mercy on us and on the whole world. Amen. We were in Borders the other day and we were happy to see they carried our Holy Father's book Jesus of Nazareth. By being a homeschooling family, we got a discount on it. 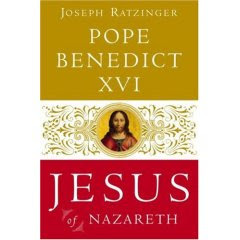 Although I am only on the second chapter, I am really enjoying learning about Jesus from Pope Benedict XVI's perspective. The other book I am reading, I picked up at a garage sale at a Synagogue the other day. I am a fan of Isaac B. Singer's books which usually consist of short stories. The Family Moskat is a novel which follows a Jewish family in Poland all the way until the persecution of the Jews during World War II. I expect this book to be a little different from what I usually read by Singer but so far, it is a very good book. I also started reading the biography on St. Josemária Escrivá. It is translated from the original Spanish into English. I think I would prefer to read it in the original Spanish. If you could recommend one book to read this Summer, what would you recommend? Please leave your choice in the comment section. Mahalo. Pewsitter is a unique Catholic news web site that was launched earlier this year. 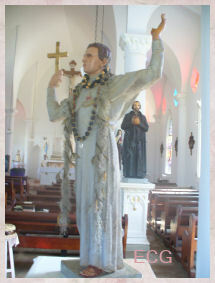 we do feature Catholic related news from around the world. The news on the site comes from two sources. 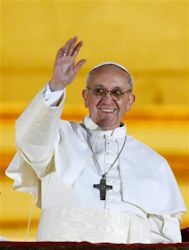 The main source is from the conventional secular and Catholic press. We scour the news every day and put on Pewsitter those stories about the Catholic Church, faith, religion and the important moral and spiritual struggles of the day. The second news source is the Catholic lay faithful. The concept behind the site is to enlist an army of "pewsitters" to be the eyes and ears for Pewsitter - hence the name. By submitting newsworthy items to Pewsitter, the laity can help shape and influence the Church and be a powerful force for positive change. We would very much appreciate your assistance in getting the word out about Pewsitter. faithful Catholics to go to the site and to begin to use it. 4. Keep us in your prayers. Thank you in advance for your assistance. 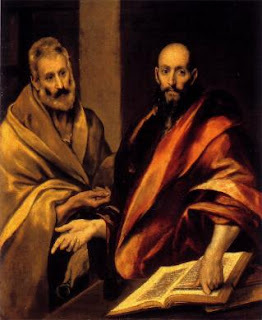 I know as a faithful Catholic, you will do what you can to assist us with this apostolate- and for that we are grateful. Would you kindly get back to me and let me know if you can assist us by putting a link on your site. p.s. Below is some suggested linking information. with thousands of other faithful Catholics. I'm sure by now you are familiar with what is expected on July 7th. Please read Fr. Martin Fox's post on it. I think he makes some pretty good points. 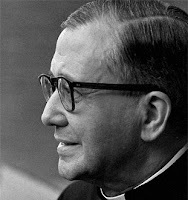 Since visiting my parents, I have a developed a growing interested in St. Josemaría Escrivá. My mom mentioned a little anecdote about his name and I'd like to share it with you. It seems that his original name was Jose Maria Escriva. The word "escriba" pronounced without the accent at the end of the word, means "scribe". His classmates would taunt him and his sister with "scribes and pharisees" and this would embarrass little Josemaría. His father told him to never put up with these affronts to their family name and that stuck with him. It was around 1928 that he added the accent mark to the end of his surname on the "v" so that no one would write Escrivá without the accent mark or with a "b". It no longer meant "scribe". It should be noted that in Spanish, the "v" and "b" are pronounced the same so it is easily understood why people would make that spelling error when writing the Escrivá name. 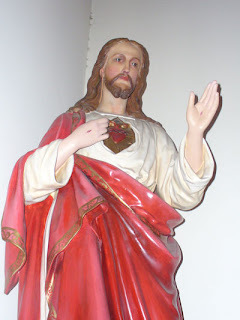 Photo of the Sacred Heart statue taken at St. Stephen's Catholic Church, Paterson, NJ. Take away, O my Jesus, the blindness of my heart, that I may know Thee; take away the hardness of my heart, that I may fear Thee; take away the coldness of my heart, that I may resist everything that is contrary to Thy will; take away its heavy, earthly sluggishness and selfishness, that I may be capable of heroic sacrifice for Thy glory, and for the souls whom Thou has redeemed with Thy own most precious blood. Amen. Many of you may recognize the statue of the Divine Child Jesus of Colombia. 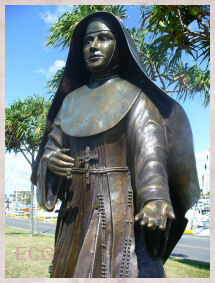 Mother Angelica has helped make devotion to the child Jesus a popular devotion worldwide. 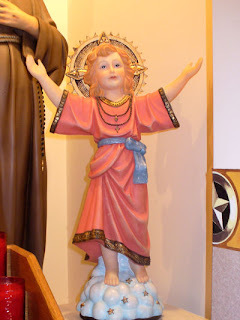 "Divine Child Jesus,/ In my difficulties: help me/ From the enemies of my soul: save me/ In my errors: enlighten me/ In my doubts and pains: comfort me/ In my solitudes: be with me/ In my diseases: invigorate me/ When others despise me: encourage me/ In temptations: defend me/ In difficult hours: strengthen me/ With your paternal heart: love me/ With your immense power: protect me/ And, into your arms, when I die: receive me. Amen." 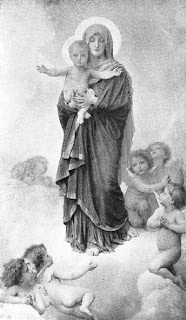 Bouguereau.—Madonna of the Angels. 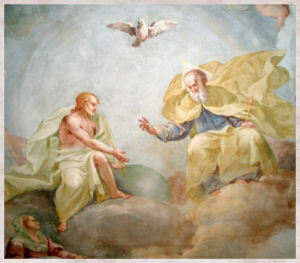 He also painted the Madonna in this blog's header. While looking for a specific picture of the Blessed Mother, I came across an interesting online book. 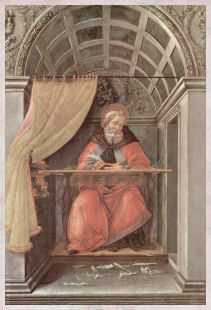 The Project Gutenberg EBook of The Madonna in Art, by Estelle M. Hurll. This link is being added to my sidebar. 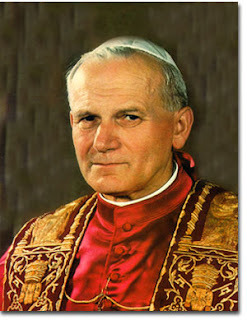 Recently my mom received Holy cards with relics of Pope John Paul II. They are beautiful little cards suitable for framing, which one of my sisters did. Make LIFE the most important issue in elections. Thanks to Blogging, I WonTwo Contests in a Row! First let me start off by telling you that I never win anything. Seriously, I don't win contests, competitions or even board games. I do enter and compete for the mere fun of it. 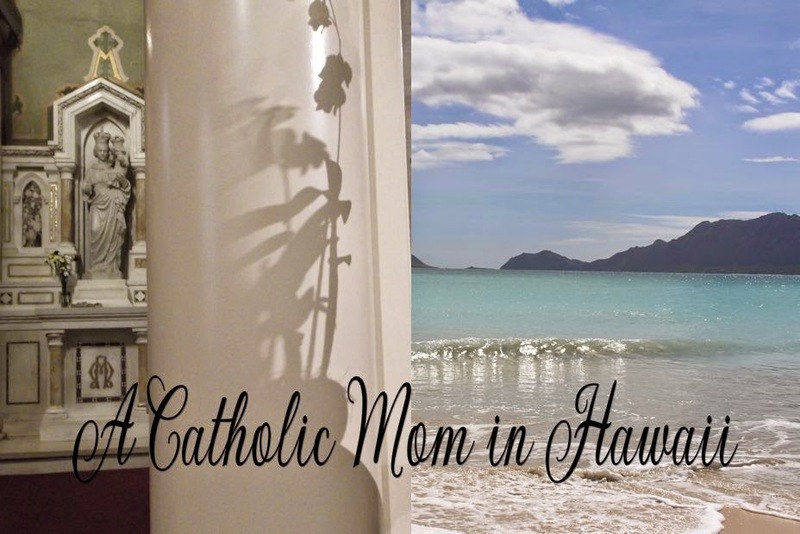 It came as quite as a surprise to me that I won two Catholic mom blogging contests. One in May and one in June. How about that!!! 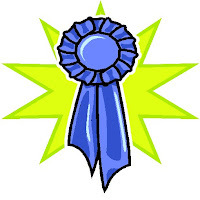 The newly created Catholic Moms Online sponsored a contest for the new members. As a new member I was automatically entered to win a lovely photograph/art work of Our Lady by the owner Angie. Guess what? I was one of two winners! Angie mailed me the very beautiful picture. I can't wait to get home and frame it. Early this month, Danielle Bean organized a raffle to benefit St. Gianna's Home for Unwed Mothers. Many generous moms donated prizes for this worthy cause. One of them was Barb S of SFO Mom. Barb generously donated a year's subscription to Faith and Family. As you may already know, this is a great magazine for Catholic families. In fact, Danielle is their editor! Well, guess what? Danielle and Barb informed me that I had won the magazine subscription! How wonderful is that? So, thanks kind ladies for the opportunity to win these lovely prizes. They are sure appreciated! 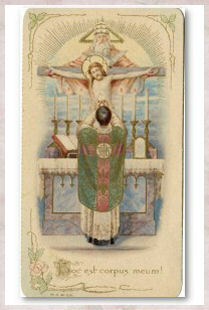 Picture source, Catholic Art Be sure to check out their other lovely Catholic pictures in their online store. 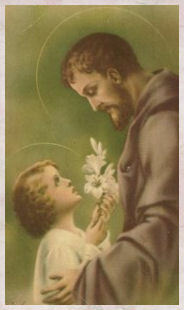 Saint Joseph, please obtain God's grace and protection for my family and for all families. Make our home safe and pure, the kingdom of Jesus and Mary - a sanctuary of peace, joy and love. Your protection is greatly needed today because God's enemies are trying to desecrate and destroy the family. While on earth, you saved the Child and His Mother. So today protect our families and make our homes sanctuaries of prayer, love, patient sacrifice and work. May they be modeled after you own at Nazareth. Remain with us with Jesus and Mary, so that by your help we may obey the commandments of God and of the Church, live a life a prayer and foster religious instruction in our homes. 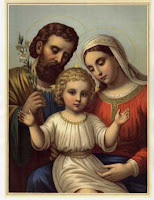 Save us from the evil that surrounds us, and grant us the grace of going to Heaven to eternally live in the company of the Holy Family. 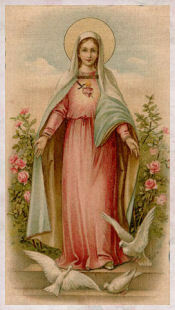 From America Needs Fatima prayer card. Update: It appears Ebeth of A Catholic Mom Climbing the Pillars had children on our minds yesterday. Please be sure to read her post. 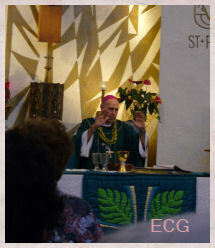 Carmen Buono, who turns 69 today, is the oldest new Catholic priest in the country.